As you can probably infer, I have some major work to do–for one thing, I need to type out an introduction (re: the “about” section) that outlines Cornelia Adair’s biographical context and significance. Right now, my next big task is to get familiar with Neatline. Although I can link the items I’ve created in Omeka to records on Neatline, I’m struggling to pinpoint the Neatline records to specific locations on a map (I had thought it would be as easy as typing in locations on a search engine, but alas….). 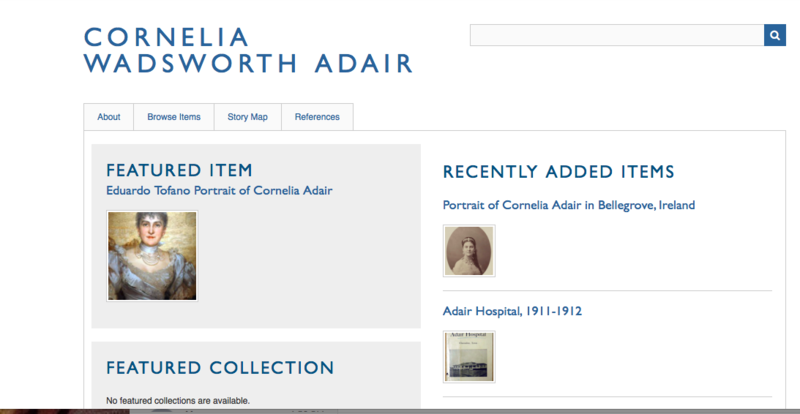 Given that the bulk of my project focuses on mapping out biographical information to tell a story about Adair’s connection to geographic spaces, I need to develop the map on Neatline or consider using a different plugin. 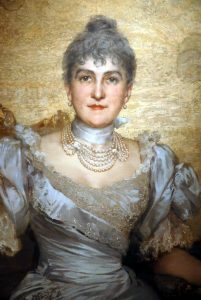 Edward Tofano Portrait of Cornelia Adair. T.D. Hobart Papers, Panhandle-Plains Historical Museum. I’m very grateful for how willing he was to accommodate the needs of my digital project. 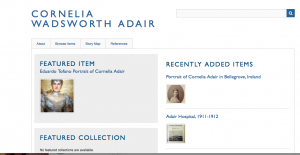 The archivist at Panhandle-Plains also put me in touch with a professor at Texas Tech University who is currently writing a biography of Cornelia Adair. Recently, I completed a 10-page research paper on Cornelia Adair to summarize my project for a grant award, which was hugely helpful in that it gave me a large bibliography of resources to draw from as I build my website. I primarily focused on the way Adair’s biographical legacy intersects with the legacy of specific places (including Geneseo, Glenveagh Castle, and the JA Ranch). That said, writing the research paper allowed me to compare two mediums of analysis–a conventional paper and a digital map–to consider how the digital map informs the way I think about my project. I found that the map (or, barebones of the map) is much more useful for incorporating primary source material (such as pictures or letters) and discussing their significance than that of a conventional research paper. I also appreciate how easy it is to link outside sources–for instance when adding metadata for an Omeka Item, I can readily hyperlink my sources so readers can view other information on Adair, such as the Panhandle-Plains Historical Museum. All in all, I’m happy with the way my website is developing, even though I have a lot of work to add and change before the story map of my project can show how Cornelia Adair helped transform particular geographical spaces. Digital Humanities at Geneseo is part of the English @ SUNY Geneseo network.